New Press, The, 9781595580498, 230pp. From an acclaimed, original observer of media and culture: how we can draw upon popular fantasies to create an alternative politics through imagination and spectacle--a twenty-first-century manifesto for the left. What do Paris Hilton, "Grand Theft Auto," Las Vegas, and a McDonald's commercial have in common with progressive politics? Not much. And, as Stephen Duncombe brilliantly argues, this is part of what's wrong with progressive politics. According to Duncombe, culture--and popular fantasy--can help us define and actualize a new political aesthetic: a kind of dreampolitik, created not simply to further existing progressive political agendas but help us imagine new ones. BR>"Dream" makes the case for a political strategy that embraces a new set of tools. Although fantasy and spectacle have become the lingua franca of our time, Duncombe points out that liberals continue to depend upon sober reason to guide them. Instead, they need to learn how to communicate in today's spectacular vernacularnot merely as a tactic but as a new way of thinking about and acting out politics. Learning from Las Vegas, however, does not mean adopting its values, as Duncombe demonstrates in outlining plans for what he calls "ethical spectacle." 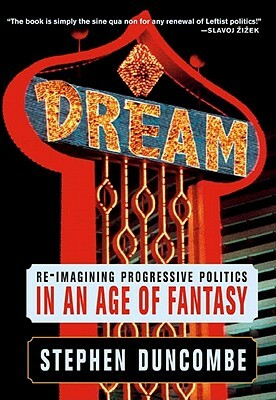 An electrifying new vision of progressive politics by a lifelong political activist and thinker, "Dream" is a twenty-first-century manifesto for the left, reclaiming the tools of hidden persuaders in the name of spectacular change.